Many have seen the TV or movie version of Washington Irving’s famous short story, The Legend of Sleepy Hollow but what better way to appreciate a work of art is to read the original version. First published in his collection The Sketch Books of Geoffrey Crayon, Gent., the short story is set on a Dutch Settlement known as ‘Tarry Town’ where strange tales are told. It revolves around a tall and gangly school master who falls in love with the beautiful Katrina Van Tassel and tries to woo her away from his rival suitors until one night he was hunted by the headless horseman who roams around the town. One thing that stands out in this story is its detailed narration. You can almost picture the images or smell the fruits of harvest in the tale. I personally like the sophisticated language and intricate plot. Irving has done a brilliant job on capturing the senses of the readers. The writer’s approach is lighter than its film adaptation. It may not give you a deep chill to the bone but it will surely offer you a few goose bumps along the way. 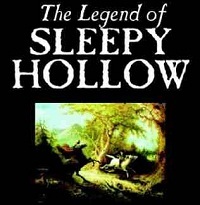 Overall, The Legend of Sleepy Hollow is a perfect quick fix for that reading void. So download, read and devour on this classic tale.